"For the next few minutes you're going to be closer to your God than you've ever been." This made-for-Cinemax film from writer/director Kari Skogland is a real-time suspense thriller, raising questions about gun control and that heavily debated founding fathers stickler of "the right to bear arms." Compound that with the plot's use of having the main character be a sniper, and Liberty Stands Still seems poised to be not just a message film, but one with seemingly close parallels to today's headlines. Liberty Wallace (Linda Fiorentino) is co-president of a huge gun manufacturing company, one that apparently sells arms to literally anyone, whether legal or ethical. During a stop at a downtown L.A. (actually Vancouver) hot dog stand, Liberty's cell phone rings and man who calls himself Joe (Wesley Snipes) informs her that he has a high-powered rifle pointing at her chest, a point that is reinforced by the tell-tale red dot from a laser sight. Joe informs her that the hot dog stand is filled with enough explosives to level a city block, and that if her cell phone disconnects or the battery dies (which will happen in about 90 minutes) he will detonate the bomb. What follows is a long series of cell phone conversations between Joe and Liberty about guns, which slowly reveal the real intent of the sniper, as it becomes quickly clear that she was not a random target. Joe's high-tech sniper's perch is full of video monitors and laptops, and he acts as some sort of controlling Grand Guignol director as the situation intensifies. Liberty's co-president husband is oily Victor (Oliver Platt), who is less concerned about his wife's safety than he is for maintaining the secrecy of some of the company's less than legal deals. The questions about gun sales, arms dealers and whether or not we really do have a right to bear arms is worthy subject matter for a film, and the taut interplay between Fiorentino and Snipes touches on these salient points. Skogland's point/counterpoint script really holds together well until about the three-quarter mark, when the appearance of some mysterious CIA snipers really dumbs things up, and the climax comes across quite rushed and at times completely nonsensical. A film like this is frustrating, because the setup and premise are so full of potential that to see it fail to deliver dramatically at the end is a let down. The problem isn't necessarily with Skogland as a director, because her use of rapid cuts and angles is visually strong and the film itself is assembled effectively; it is the script that meanders and eventually sputters out after placing the characters in tense situations. Image Transfer Review: Liberty Stands Still comes from Lion's Gate in a 1.85:1 anamorphic widescreen image transfer. Colors are relatively even and bright, with fleshtones rendered naturally. Much of the film has a cold and stylized slate blue hue to it, and the presence of some pesky fine grain is highlighted during some of the darker scenes. Audio Transfer Review: Here's a DVD that knows how to take full advantage of the 5.1 Dolby Digital, because the audio track is loud and aggressively mixed. Rears are used heavily, with detached voices swirling from behind, and of course the old reliable helicopter zipping by overhead. My only complaint is the dialogue in the center channel is mixed a bit low, especially in relation to how dominant the other channels are. Extras Review: Director Kari Skogland, producer Gary Pearl and editor Jim Munro provide a full-length, scene-specific commentary track that tries to explain what Skogland refers to a "technical Rubik's cube." The three commentators don't dwell much on idle puffery, and spend most of the time explaining in depth how the film was shot sequentially, and for example how Fiorentino and Snipes were kept isolated from one another to assure their characters would not have any type of prior intimacy with one another. It is a nicely structured and presented track, and one that reveals a lot of the subtle complexities involved in the production. A Split Screen section takes four scenes (No Mustard, Showtime, Details, Panic) in full-frame, work print format, and splits each sequence into four separate angles. This might have had more meaning with input from Skogland, but the scenes are brief enough that it doesn't involve a big investment of time to sit through. The disc also features the dreaded "multiple angle" option for approximately thirty minutes of the film. Maybe it's my player, but seven out of ten times when this option is available nothing ever happens, except for being distracted the camera icon. Perhaps it will work for you, and then you can let me know if I missed anything. The disc is cut into 24 chapters, and also includes a theatrical trailer and subtitles (English and Spanish). 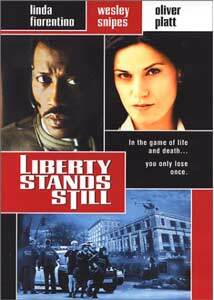 Liberty Stands Still is one of those films that starts out with a bang, and manages to hold the tension until the third act when the story collapses. Fiorentino, who I think is truly underrated as an actress, gives another strong performance, while marquee star Snipes isn't left with much to do but utter his lines into a cell phone.